An understanding and application of the basics of eating and drinking before, during and after exercise will greatly help your preparation and ride experience. Riders sometimes don't realize the importance of before and after, and tend to only think in terms of during ride itself. With respect to the above, practice drinking and eating during training rides - don't leave it to the actual event. That way you will get to know what is best for you personally. Experiment a little with different products. Check out this fueling handbook. 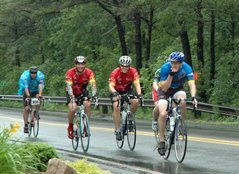 How far apart are water stations during the ride? How much water/fluids do you suggest carrying with us on the ride? andy, the first day there are 7 stops and I think a similar amount the second day. They are roughly 10 miles apart buyt some stretches are longer. I like to ride with 2 large bottles. If the weather is forcasted to be really hot, I might consider more.